Asus is going to launch a sequel to its quirky Padfone, named, as if you couldn’t guess, the Padfone 2. The company has begun to circulate invitations to the event where it intends to show off the new device, which will take place on October 16. The original Padfone had a long and drawn out gestation, as it initially appeared at the Computex show in May 2011 with a Christmas release date attached. This wasn’t really the case, and that first Padfone was more of a concept that a real product — a fact backed up by Asus’ redesign of the Padfone for Mobile World Congress 2012. Eventually, after more delays, the Padfone went on sale in the USA in June 2012, having popped up in several other countries already. The price bordered on the ridiculous, with the complete package of the phone, tablet and keyboard dock likely to set owners back more than $1000. Here’s a reminder of the specification: The phone has a 4.3-inch Super AMOLED screen and a 1.5Ghz dual-core Snapdragon processor, while the tablet has a 10.1-inch display, and needs the phone to be docked before it does anything. Many will also remember Asus’ solution to the problem of how to answer incoming phone calls when the pair are docked — a stylus that transformed into a Bluetooth earpiece! Say what you like about the Padfone, it was brimming with innovation, and perhaps didn’t get the recognition or success it deserved. Half the price, half the quirk? So, here comes the sequel. 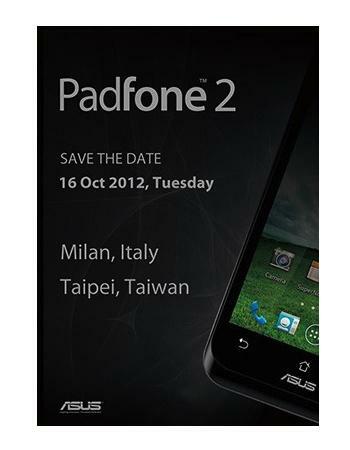 The invitation makes it very clear it’s the Padfone 2 that will be announced, and that there will be two — presumably simultaneous — launch events, one in Milan, Italy and the other in Taipei, Taiwan. Asus gives nothing away about the new Padfone 2, but we can see the bottom corner of the phone section, which reveals nothing more than a pair of virtual buttons and the Android operating system. Given how quirky the first Padfone was — for a piece of consumer electronics, anyway — will Asus have calmed down with the follow-up, in an effort to make it more popular? A set of benchmark figures claimed to be from the Padfone 2 hint at the new device using a quad-core Snapdragon processor, and boasting 2GB of RAM, plus — sadly — Android 4.0 Ice Cream Sandwich. The leak is accompanied by speculation that the new Padfone 2 won’t arrive until 2013, which sounds plausible now we have the date of the launch event. Will the Padfone 2 achieve success for Asus? Well, the public could be more receptive this time, thanks to Asus’ and other manufacturers efforts with tablet/laptop hybrids; but more than anything, it’s the price that needs to be right, otherwise it runs the risk of being regarded as another expensive novelty.